Sovereign wealth funds are still hungry for Western banks. Even though an early-crisis wave of financial investments mostly ended badly, Credit Suisse’s latest 3.8 billion Swiss franc cash call shows rich states still have faith in global lenders. A few eye-popping returns aside, sovereign funds have fared badly from bank recapitalisations. The Abu Dhabi Investment Authority’s 2007 punt on Citigroup was so disastrous it launched arbitration against the U.S. bank. The recent rate-rigging scandal at Barclays, which counts Qatar Holding and Abu Dhabi’s Sheikh Mansour among its largest shareholders, has given sovereign funds another reason to be wary of bank stocks. But even though Credit Suisse shares are trading at their lowest level since the early 1990s, the Swiss bank only had to offer mildly attractive terms to win the support of its existing shareholders. Qatar Holding and Norway’s Norges Bank – as well as Saudi Arabia’s Olayan Group – all bought into Credit Suisse’s offering of mandatory convertible shares. They will collect a four percent annual coupon until the notes convert into ordinary equity next March at a five percent discount to the pre-announcement share price. Granted, the Gulf investors haven’t fared so badly since pumping a large chunk of capital into Credit Suisse in late 2008. That’s because they bought hybrid capital notes as well as ordinary equity. These notes pay an annual coupon of around 10.5 percent and will continue to pay around nine percent once they are exchanged into new so-called Buffer Capital Notes. Credit Suisse’s existing shareholders have an incentive to protect their investments from dilution. But the participation of Temasek suggests new investors also see some scope for recovery in a bank with a footprint in emerging markets and large base of high net worth clients. The Singaporean fund has reason to be cautious: it suffered a hefty loss on its late-2007 bailout of Merrill Lynch. And its local rival, the Government of Singapore Investment Corporation, is in the red on its investment in UBS. The enduring enthusiasm may simply reflect a lack of attractive alternatives. With Western government bonds offering minimal or even negative yields, sovereign funds seeking a return have to look elsewhere. They will find it hard to ignore banks. A logo is seen in front of a Credit Suisse building in Zurich. 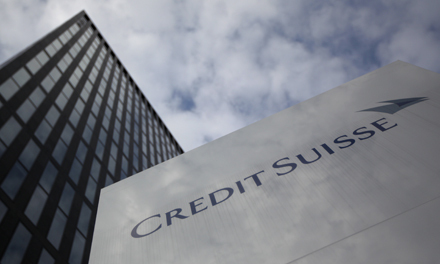 Credit Suisse initiated a series of measures on July 18 to boost its capital position, including a 3.8 billion Swiss franc issue of mandatory convertible securities to new and existing investors. The securities will pay an annual coupon of four percent until they convert into 234 million ordinary shares in March 2013. Half the issue will be taken up by strategic investors including Qatar Holding, Saudi Arabia’s Olayan Group, BlackRock Investment, Capital Research Global Investors, Norway’s Norges Bank and Singapore’s Temasek. A group of the strategic investors have also underwritten the other half of the issue, which will be offered to existing Credit Suisse shareholders. In addition, the Olayan Group has agreed to accelerate its plan to exchange 1.7 billion Swiss francs of hybrid capital notes in Credit Suisse into so-called Buffer Capital Notes. Completion is now expected by July 31. The hybrid capital notes currently pay an annual coupon of around 10.5 percent. The new Buffer Capital Notes will pay a coupon of around nine percent. Olayan currently owns 6.6 percent of Credit Suisse. Qatar Holding owns a 6.2 percent stake.